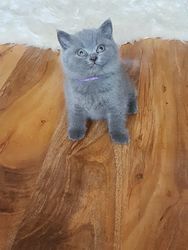 I have adorable beautiful British Shorthair kittens available. I have two blue males, one blue female, two blue colour-point bicolour & white males.I also have one cream male, one lilac female, two blue tortie & white females, one lilac tortie female, one blue cream female and two lilac & white bicolour males, all of these are ready to go.All kittens are fully vaccinated, GCCF Registered, Micro chipped and Insured.They are all very lovable and are very friendly with children, and have a good nature with other animals.Please provide your mobile contact numbers plz.They are raised in a family home. We are so pleased to announce our stunning beautiful British Blue babies.